Studies show caregiving duties begin to take up more and more time as caregivers age. Fortunately, resources are available to help caregivers and their loved ones manage housing, budgeting, driving, and more. Although many people take it on with grace and generosity, extended caring for an older parent or someone who’s chronically ill can wear away at the caregiver’s vitality, finances, and even career growth. It also can be an overwhelming source of stress, especially as the caregiver ages. Out of about 43.5 million caregivers in the U.S., 34.2 million care for someone who is 50 years of age or more, and 15.7 million care for someone with some form of dementia, according to statistics from the National Alliance for Caregiving. As caregivers age, they spend more and more time in caregiving activities, according to this graph from the Center. 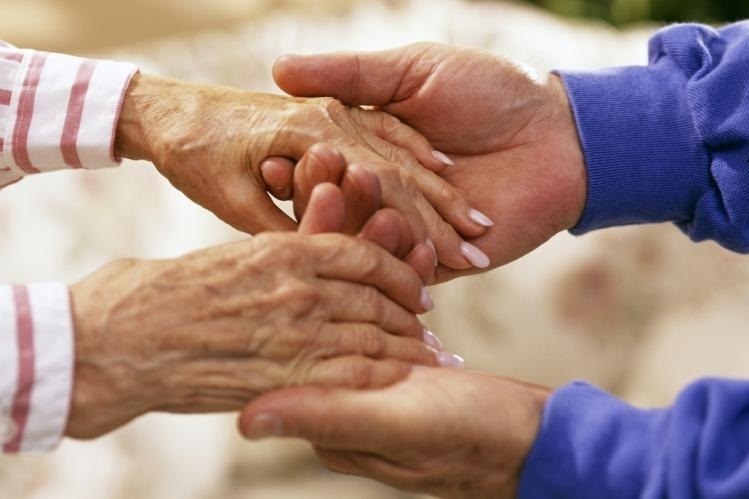 While caring for a loved one may be a labor of love, it will always be time consuming. However, there are resources available to ease the burden and give you some respite. To that end, here are some of those resources and tips that could help you with your caregiving responsibilities. The Village to Village Network (http://www.vtvnetwork. org) is an umbrella for a series of grassroots civic organizations that assist seniors in various ways. Over 100 of these organizations, or "villages" exist across the U.S. in metropolitan, suburban, and rural areas to help the elderly find access to reliable, discounted providers and affordable services, such as transportation, home repairs, and health care. The villages also coordinate social and educational outings and excursions. "Villages link residents, community resources, companies, and volunteers to provide the services and support that seniors need in what the industry calls a naturally occurring retirement community," said Christopher J. Debarres, co-owner of Help Unlimited (http://www.helpunlimited.com), which offers professional caregiving services for seniors. Caregivers generally manage the budgets and expenses for not one but two households. They may feel uncertain about managing their elderly parents’ money effectively. They may be pressured by siblings to abstain from spending to preserve the inheritance. They may spend more of their personal income than they should. A financial advisor can help you with your financial responsibilities. Tracking expenditures for both households is often partially or fully neglected when the caregiver has many responsibilities to handle. An advisor can assist by providing checklists, spreadsheets, and guidance on budgeting and savings. The elderly face a much higher risk of car accidents and traffic violations than younger drivers do. Why? Their hearing, vision, and motor reflexes frequently become impaired as they get older. A chronic illness worsens over time. A sudden condition (i.e., stroke or falling accident) may result in loss of the motor skills needed for driving safely through rush hour traffic and congested highways. Although state regulations vary widely for elderly drivers, most states require them to take vision exams before their licenses are renewed. Nineteen states require more frequent vision exams for elderly drivers than for younger drivers. Twenty states mandate shorter license renewal periods above a certain age. Maryland and Washington, D.C. require a physician’s approval for drivers aged 70 and up to renew their licenses. The Housing Choice Voucher Section 8 Program. (http://portal.hud.gov/hudportal/HUD?src=/topics/housing_choice_voucher_program_section_8) Run by local Public Housing Authorities (PHAs), the Section 8 Program offers affordable private housing for the elderly, disabled, and very low-income families. Individuals who join the program may find their own housing instead of being placed, so long as all Section 8 housing requirements are met. HOPE for the Elderly Independence Program. (http://portal.hud.gov/hudportal/HUD?src=/programdescription/hope4)The Homeownership and Opportunity for People Everywhere (HOPE) Program is also administered by local PHAs. HOPE provides Section 8 rental subsidies to low-income senior citizens, along with other supportive services. To be eligible, an elderly individual must be at least 62 years old and find it hard to perform a minimum of three daily living tasks (such as eating, bathing, grooming, dressing, or toileting) and home management tasks (such as laundry, cooking, cleaning, shopping, and so on), according to the Department of Health and Human Services. Section 202 Supportive Housing for the Elderly Program. Similar to the HOPE Program, the Section 202 Program (http://portal.hud.gov/hudportal/HUD?src=/program_offices/housing/mfh/progdesc/eld202) gives rental assistance to financially challenged seniors. Under this program, people with disabilities may also benefit from meals, transportation, and accommodations. You can find more information on affordable housing options at eldercare.gov (http://www.eldercare.gov/Eldercare.NET/Public/Resources/Factsheets/Govt_Assisted_Housing.aspx) and hud.gov (http://portal.hud.gov/hudportal/HUD). Providing care to older parents, children with special needs, or others who are not fully independent can take a toll on your emotions, time, and finances. Take advantage of all available resources—both public and private—to help you manage your caregiving responsibilities. Margarita Abramova is a New York City-Based Writer. IMPORTANT NOTICE This reprint is provided exclusively for use by the licensee, including for client education, and is subject to applicable copyright laws. Unauthorized use, reproduction or distribution of this material is a violation of federal law and punishable by civil and criminal penalty. This material is furnished "as is" without warranty of any kind. Its accuracy and completeness is not guaranteed and all warranties expressed or implied are hereby excluded.